“For much of the first half of 1940 Basie worked around New York and Boston. He was at the Apollo Theatre on at least three occasions and the Golden Gate Ballroom, both venues in New York City, and at Boston's Southland Ballroom, from which latter location an excellent broadcast transcription dating from February 20 has been released on a number of labels. By now the powerful trumpet of Al Killian had replaced Shad Collins and the distinctive Vic Dickenson had joined the trombones, taking the place of Benny Morton who left to join pianist Joe Sullivan's band. a. Failure to book the band into spots with radio wires. c. Long jumps on tour: 500 miles a night 'not unusual. We've jumped from New York to Chicago in one night'. d. The band has been a big grosser everywhere it's played (including a recent Southern tour) but 'MCA got some nineteen thousand dollars in commission last year. Basie got seven thousand himself and the band got five thousand. Does that make sense? Benny Goodman (and played on some of Benny's sextet recording dates) while the rest of the Basie men 'loafed around New York'. Manager Milt Ebbins said he was taking the mismanagement case to James Petrillo, head of the American Federation of Musicians. 'We haven't had a location job with air time for a year. Some weeks we work every night, jumping 500 miles a night. Other weeks we lay off No one seems interested in Basie at MCA'. By the end of the year an uneasy truce was proposed with MCA taking less commission from the band's bookings. But Basie suffered another setback a couple of weeks before Christmas. Columbia had set up a recording session for Friday, 13th December, 1940 in order to record four titles (It's the same old South, Stampede in G minor, Who am I? and Rockin' the blues); on the day of the session Basie's star soloist, Lester Young, failed to show up. Rumour has it that he objected to making records on Friday The Thirteenth but those close to the event deny it. In any case Basie was forced, at short notice, to bring in Paul Bascombe on loan from the Erskine Hawkins band, and to allocate the tenor solos on the date to Buddy Tate. It was the parting of the ways, at least temporarily, for Lester and Basie and while the precise reasons for Young's departure may never be known, it is worth recording that Lester's wife, Mary, wrote a letter to Down Beat magazine stating the Lester left Basie of his own accord and was not fired. Another Down Beat report of interest occurs in the January 15, 1941 issue referring to the months of wrangling between Basie and MCA. Count bought his release from the agency for ten thousand dollars and joined William Morris. 'Willard Alexander, Morris band department executive, will personally guide Basie and the band just as he has been doing for the past four years, even though he and Basie were with rival booking offices. Also in the picture is Milton Keith Ebbins, youthful Basie road manager and former band leader, who now becomes personal manager of the Basie outfit. Alexander and Ebbins together will accept or reject all bookings offered. Basie's band hasn't been working much lately. On January 3rd he started a theatre tour, opening at the Apollo in Harlem - the first job to be booked by Morris'. Following the departure of Lester Young, Count used a number of temporary substitutes in his reed section then, at the end of February, 1941, Don Byas took over on a permanent basis. Miss Humes's eloquent statement tells us more about the reverse side of the show-biz coin than a wealth of conjecture. Life on the road with a touring band has never been good but for girl singers the pressures were greater. Basie brought in Pearl White, a former singer and dancer at the Apollo Theatre in Harlem, as a temporary replacement for Helen and later in the year, Lynne Sherman, one-time vocalist with the Sonny Burke band and now married to Basie's manager Milt Ebbins, sang with the band at an engagement at Boston's Ritz-Carlton. (Lynne also recorded a couple of sides with the band at the end of 1941.) But Jimmy Rushing was still the major attraction in the vocal department, singing the blues and generally giving the band its deeply committed Kansas City sound. Ballads on records were handled by Earl Warren, who was also leading the sax team. The Okeh releases of 78rpm discs usually had an Earl Warren vocal on one side and a more extrovert instrumental number on the other. British EMI, which then had a contract with American Columbia, parent company of Okeh, released Basie records in Britain during World War Two on its Parlophone label and invariably cross-backed the instrumentals, omitting most records with a vocal. One Basie performance with a singer which was issued both in the US and Britain was the two-sided King Joe, a somewhat unexpected pairing of the Count's orchestra and the vibrant voice of Paul Robeson. Some of the arrangements for the vocals brought in unexpected names; Hugo Winterhalter, for example, scored some of the Earl Warren features. Basie was also using compositions and arrangements from unusual sources for his instrumentals too; Stampede in G minor was written by Clinton P. Brewer, a convicted murderer then serving a 19 year jail sentence while Beau Brummel was by the diminutive Margie Gibson. It is likely, however, that many of the titles which the band recorded for Okeh/Columbia were seldom played in public for the band was still working predominantly hotel ballrooms and theatres where the programme of music was certainly less experimental. Basie, like Duke Ellington, may have felt that he was working for two audiences, those who paid at the door to hear the band 'live' and those who wanted a more permanent reminder of the band on record. During the nineteen-forties the band was recording excellent scores by men such as Jimmy Mundy (Fiesta in blue, Something new, Feather merchant etc. ), Eddie Durham, Buster Harding, Buck Clayton and, occasionally, Skip Martin, Tadd Dameron and Tab Smith. Most of the writers seemed to write with the established sound of the band in mind. (Perhaps they knew that such scores had a better chance of finding their way into the book!) Basie was very much the leader, rejecting anything which he did not feel was right. Buck Clayton told Stanley Dance '(Count) was nice to work for, but he always knew what he wanted from the band and the arrangers. At the beginning, it used to take us so long to get through the arrangements. We'd have to help guys who didn't do so much reading, but who were great soloists and were accustomed to the head arrangements. The only reason I played all those things with a mute with Basie was because he asked me to, and as he was the leader his wishes were like commands. When I came out of the army I was my own judge and I played like I wanted to. The funny thing about Basie was that he'd ask me to record with a mute, but when we got on one-nighters he'd have me play the same thing open'. Clayton stayed with Basie until November, 1943 when he was called up by the US Army. The Count's band lost a number of men to the armed forces but there is evidence that the US authorities called more whites than Negroes, proportionately speaking, and some of the white bands of the day suffered greater losses of key personnel than either Basie or Duke Ellington. When the V Disc programme of recordings was launched, Ellington and his men made it clear that they were not prepared to take part, as a protest against the way coloured troops were treated. (The Ellington material which does exist on V Disc is generally from public concerts.) 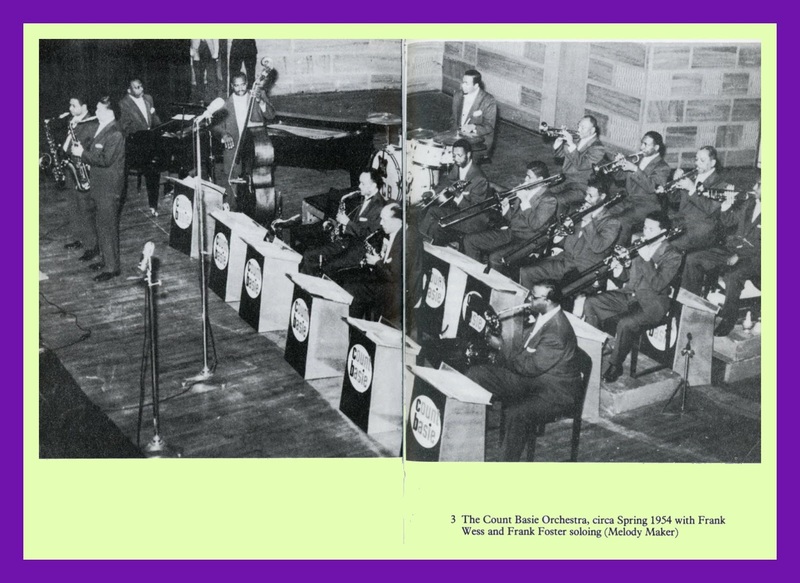 Basie, on the other hand, took part in a number of these sessions, a fact which enables us to hear the development of the band during an extended ban on commercial recordings which commenced on August 1,1942 and, in the case of Basie's recording company, did not end until December, 1944. During this period a number of important personnel changes took place. Don Byas left and Lester Young took his place, having presumably patched up his previous difference with Basie. Buddy Tate remembers that Byas left after an incident one night when Ben Webster sat in with the Count. 'I never heard anyone sound like that in my life, and all the cats flipped over Ben. Poor Don went across the street and got stoned!' Lester came into the band in December, 1943 and stayed until the following September when the army almost literally took him off the bandstand. Lester had been ignoring his call-up papers, using the excuse that, as a member of a touring band, the papers had not reached him. 'When we opened in Los Angeles that year,’ recalls Tate, 'there was a sharp young cat there who kept looking at Prez and Jo Jones. That wasn't unusual because they were stars. He sat there drinking whiskey all night, but when we got though he came over and said "You, Lester Young, and you, Jo Jones, I have to serve you with these papers. Be down at the Induction Centre tomorrow morning!" '. Their places were taken immediately by drummer Buddy Rich (who succeeded in playing with Tommy Dorsey in the early part of each evening then with Basie at ten o'clock) and Artie Shaw, who played Lester's tenor parts on clarinet. This was, of course, only a temporary arrangement until Shadow Wilson and Lucky Thompson, on drums and tenor respectively, joined on a more permanent basis. 'When Lucky arrived, he continued the Byas approach' maintains Buddy Tale. 'Lester had naturally been featured more than me, and Lucky was in his chair. Lucky quit when he decided he wanted to stay on the Coast'. Basie's visits to Los Angeles had given him the opportunity of working in films and as early as April, 1943 Down Beat was reporting that 'the Basie band can currently be seen in three films, "Hit Parade of 1943" (Republic), "Reveille With Beverley" (Columbia) and "Stage Door Canteen" (United Artists)'. The following August the band was working on three film assignments at Universal, the Donald O'Connor comedy musical 'Man Of The Family' (also known as 'Top Man'), the Olsen and Johnson sequel to 'Hellzapoppin' titled 'Crazy House' (and sometimes 'Funzapoopin') and a Will Cowan short.